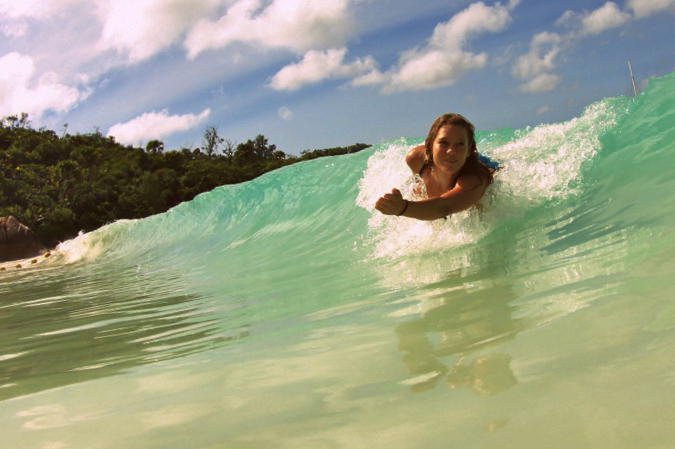 A surf craft is an piece of equipment that lets you harness the power of breaking waves. With most surf craft, the aim is to paddle 'out the back' (behind the impact zone where waves are breaking) and then catch waves, either riding the wave towards shore, or riding sideways across the clean face of a wave as it breaks. There are dozens of varieties of surf craft to choose from, but the most popular are surfboards, bodyboards, paddleboards, sailboards, surf skis, kayaks, and waveskis. Surfboards can be further categorised into shortboards, longboards, fish/hybrids, softboards and kitesurfing boards. Some craft, such as surfboats, IRBs, kayaks and surf skis can carry more than one person. Surf craft can often be ridden with little experience and only a few practice sessions, but it takes a lifetime to master them, and most craft require a reasonable level of fitness to ride well. The ocean is dynamic and demanding environment, and surf sports participants can always seek out new challenges, such as bigger waves, higher performance equipment, and more advanced manoeuvers. Once you're proficient, you can choose to enter competitions, which are held regularly on beaches all around the country. Local surfing groups exist in most beachside suburbs, and the Surf Life Saving Association is a great organisation to join if you'd like to train and compete with a variety of surf craft. Each craft requires a different set of skills, although the general principle of catching waves is similar. The guides below will help you to choose a surf craft, and teach you the basics to get you riding waves as quickly as possible. You'll also discover how to maintain your surf craft, where to find lessons, where to connect with like-minded surf sports participants, and how to enter competitions. A shortboard is a modern high performance surfboard, typically with thruster or quad fins. Built for speed and maneuverability, they're thin, light, and generally around 5-7 foot long. Not a beginner's board, as they require a high level of skill and fitness to ride. A longboard or mal (short for Malibu) is a large surfboard, typically 8-12 feet long, with a round nose. They can catch even the smallest waves, and they're easy to paddle, stand on, and ride. 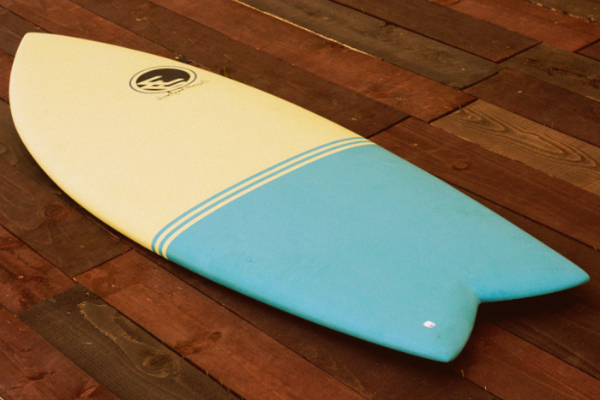 The shorter mini-mal (around 7-8 foot long) is a popular first board for beginners. Shorter, flatter and wider than a shortboard, the fish is a stubby board with a rounded profile and swallow tail. They're easier for beginners to paddle and ride, and they work well in small, weak waves. Hybrids combine the best characteristics of a shortboard and fish. Stand-Up Paddle Surfing and Stand-Up Paddle Boarding originated in Hawaii as an alternative to surfing. Participants remain standing, and use a paddle to propel themselves thorough the water. SUP models can be all-rounders, or may be designed for surfing, racing or touring. 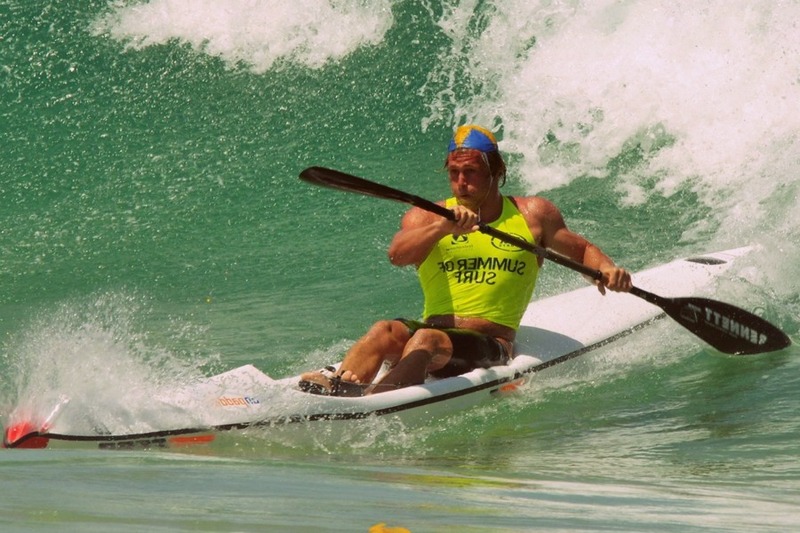 A racing mal is a 10' 6" paddleboard, propelled using the arms while lying flat or kneeling. They include four or five straps that the rider holds onto while catching waves, or while 'popping' and 'rolling' when paddling out. Also known as a ten-six, sprint board, or surf racer. Prone paddleboards are between 12-20 feet in length, propelled using the upper body and hands in a kneeling or prone position. They're designed for the open ocean rather than the surf zone. They can cover large distances, and may include a rudder that is controlled with the feet. A bodyboard is a short, rectangular foam board, ridden in the prone position. There are no fins underneath the board, but bodyboarders typically wear fins on their feet for control and propulsion. Great for kids and beginners as they're easy to learn, soft and safer in a wipeout. 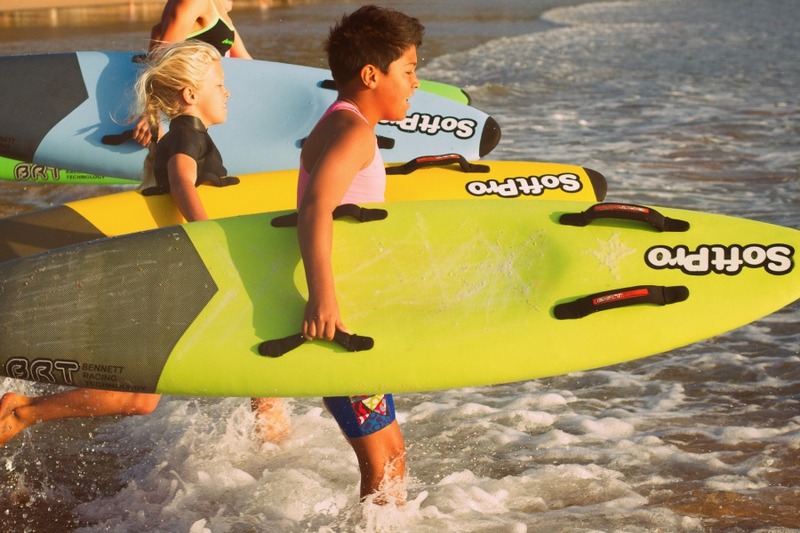 Softboards offer the ultimate in fun and safety for kids and beginner surfers. They're incredibly buoyant, stable, and easy to ride, but at the expense of manoeuvrability. 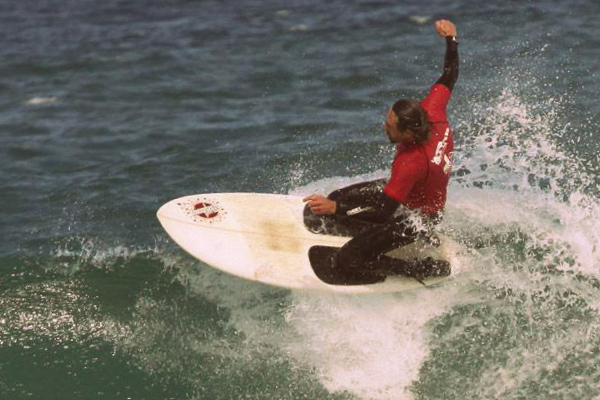 Softboards come in all surfboard shapes and sizes including shortboards, longboards and fish. 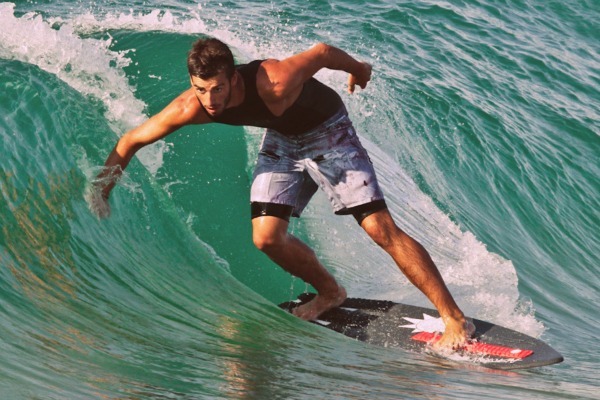 A skimboard is shorter and thinner than a surfboard, with no fins. Used from the beach, the rider runs towards the ocean, jumps onto the board, glides out to meet a breaking wave, then rides it back to shore. A variety of tricks can be performed on the way in and out. Surf kayaks have flat bottoms, hard rails, three or four fins, and lots of rocker in the bow to keep the kayak planing when surfing down the face of a wave. They're propelled using double sided kayak paddles. 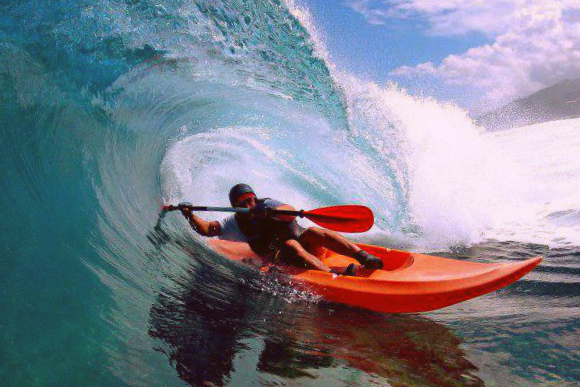 Sea kayaks can also be used in the surf, but with less manoeuvrability. There are two varieties of surf ski. Traditional spec skis, used by Surf Life Saving Clubs, are built to a standard size and weight and are designed to negotiate the surf zone. 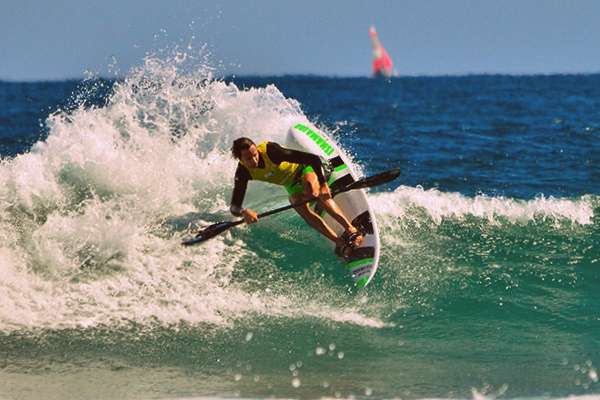 Ocean skis, designed for long distance paddling, are normally raced downwind on ocean swells. Waveskis combine the paddling power of a surf kayak with the performance and manoeuvrability of a surfboard. They resemble a large surfboard with a seat, foot straps and seat belt. The paddle is used as a fulcrum for turns and tricks. The rider can Eskimo roll if overturned. 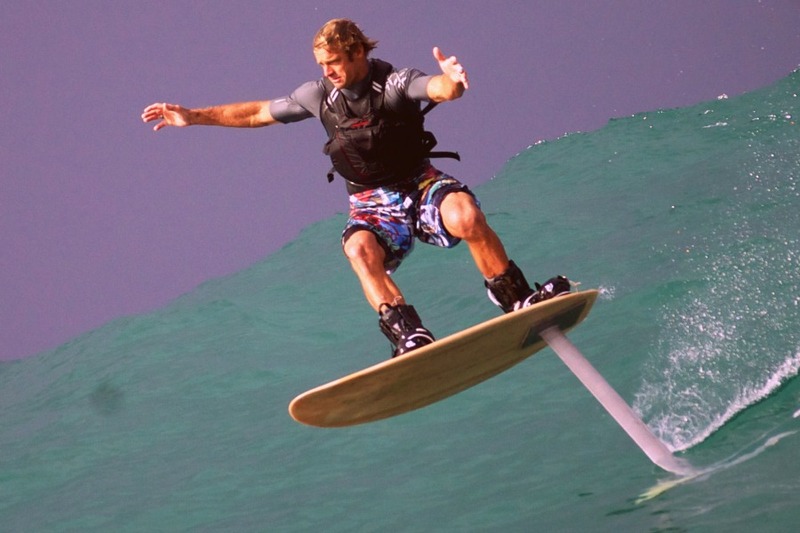 A foilboard (or hydrofoil board) is a surfboard with a hydrofoil extending below the board into the water. At high speed, this causes the board to rise above the surface of the ocean. To catch a wave, they're first towed by a boat or Jet Ski. They can also be propelled using a kite. Kneeboards are ridden in a kneeling stance, either in the surf or towed behind a boat. Surf kneeboarders catch waves by paddling or kicking. With their low center of gravity and reduced wind resistance, they can take off on steep waves, and ride higher and farther back in tubes. Nipper boards resemble small racing mals with four straps. 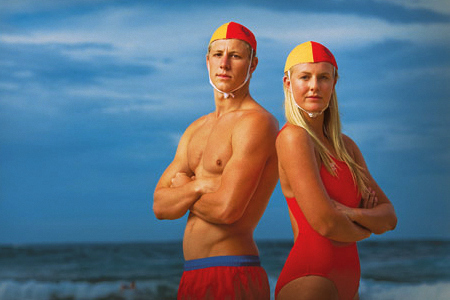 They're designed for young Surf Live Saving participants. Children up to 10 years old generally use a foam Nipper board, and children over 10 use a fibreglass board. They're built to SLSA standard specifications. Kitesurfing (or kiteboarding) combines elements of surfing, wakeboarding, snowboarding and windsurfing. Kitesurfers stand on a surfboard (with their feet in bindings) and use a large kite to harness the power of the wind and propel themselves across the water. Windsurfing (or sailboarding) combines aspects of sailing and surfing. A 2-3 metre long board is propelled by wind using an attached sail. Windsurfers can perform jumps, loops, spins and tricks. They were first to ride the world's largest waves before the advent of tow-in surfing. 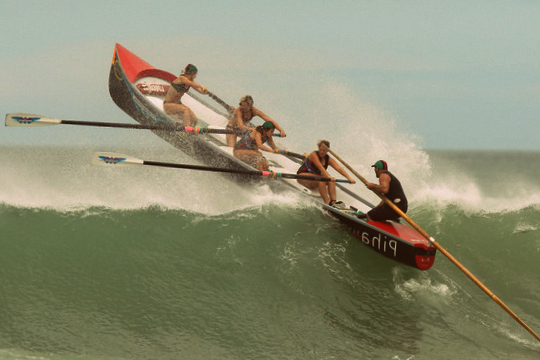 Surfboats are oar-driven boats designed to enter the ocean from the beach. Traditionally used in lifesaving or rescue missions when the fastest access to victims is via the beach. In competition, the crew comprises four rowers, and a sweep who controls the direction. 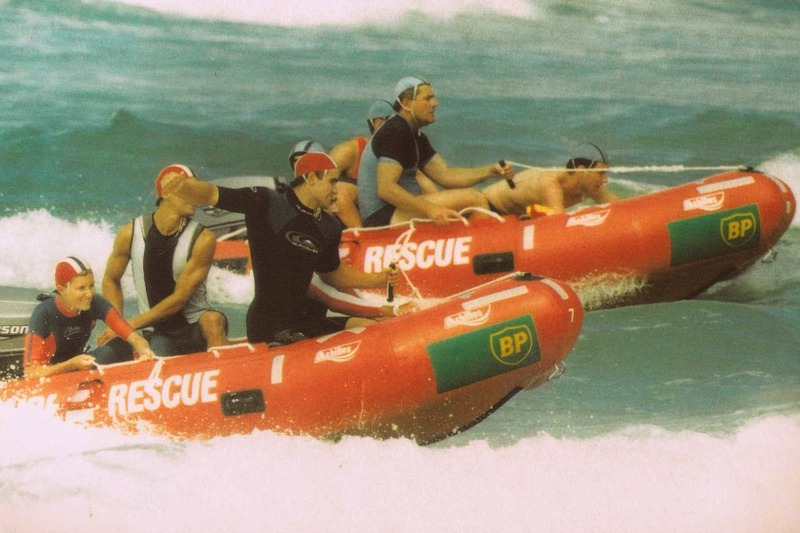 IRB Racing is a surf sport where Surf Life Saving Club teams race Inflatable Rescue Boats. 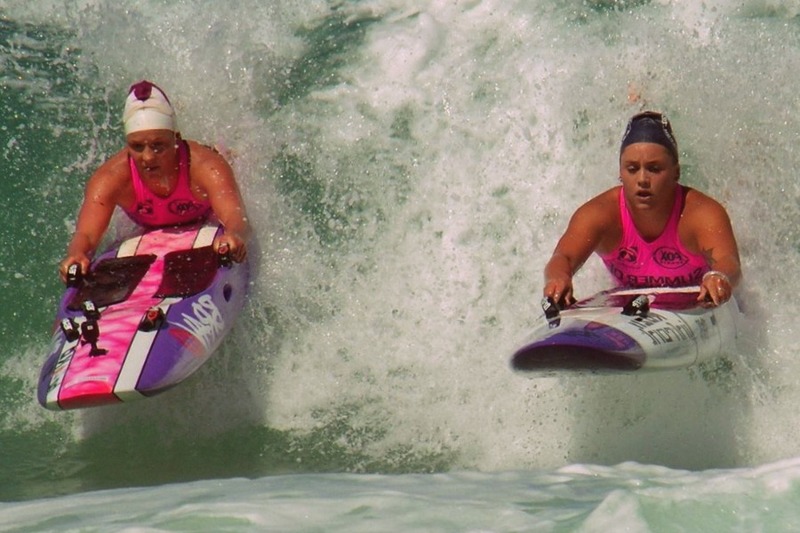 Race events include Surf Rescue, Team Rescue, Mass Rescue, Tube Rescue and IRB Relay. These simulated rescues aim to improve lifesaving skills through competition. Teams usually consist of a driver, a crew person and a patient. Sometimes you don't want to carry surfing gear to the beach. For those who prefer the flexibility of a craft-free activity, try bodysurfing, soft sand running or ocean swimming. And for the more competitive, beach volleyball, beach flags, and run-swim-run contests will get the adrenaline pumping.